190 руб. 2026 шт. 2-3 недели 2 шт. 2 шт. от 26 шт. — 78 руб. The Panasonic AM series capacitors are type X radial leaded polarized aluminium electrolytic capacitor. The capacitance value ranges from 0.1µF to 22000µF. 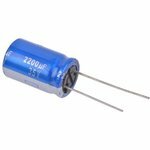 These capacitors are perfect solution for applications which require ultra low ESR, very high ripple current and very long life in small mounting form.